effectively across a whole spectrum of machines. This product is designed to be used on hot drinks vending machine brewer units such as a king brewer unit, to remove tannin stains, prevent component blockage and ensure a hygienic machine. 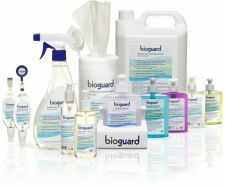 EASE OF USE — Product is supplied in easy to use dosing bottles to ensure that the correct amount of product is used on each clean eliminating product wastage and incorrect cleaning regimes. SUPERIOR CLEANING ACTION — Product is formulated to provide a superior cleaning action which results in higher levels of machine hygiene and reduced cleaning times. NON DAMAGING — Product will not damage or degrade machine components, unlike the more traditionally used aggressive chemicals. FAST ACTING — Product designed to work within 5-10 mins depending on dirt levels, enabling the cleaning and hygiene process to be carried out in the time required to refill the machine. Use daily on machines in high use sites. For all other sites used product during machine refilling. For more guidance refer to our Traditional Hot Drinks Dispensing Cleaning & Hygiene Cards. Pour dose into brewer units, pour in hot water to activate, leave for 5-10 mins to soak then flush through.